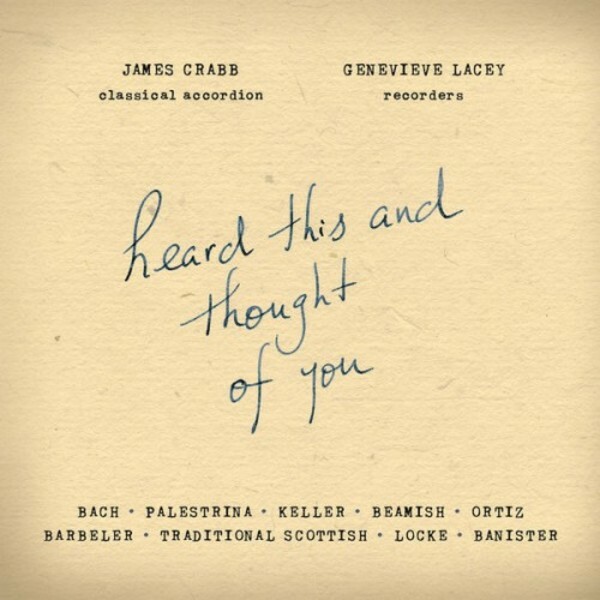 ‘Heard This and Thought of You’ presents music written across half a millennium and two hemispheres, performed by James Crabb (classical accordion) and Genevieve Lacey (recorders). The album comes with a handsomely crafted booklet including written reflections on these stunning performances by Australian writers including Michael Leunig and Helen Garner. The combination of recorder and accordion is an unlikely one - but in the hands of Crabb and Lacey it is truly magical. Lacey is an ARIA Award-winning virtuoso with a series of highly acclaimed albums to her name; Crabb is internationally acknowledged as one of the finest accordionists of his generation. The title of the album reflects the deeply evocative nature of the music, which ranges from the folk tunes at the core of the traditional repertoire for recorder and accordion, to contemporary works exploring new soundscapes. From the Renaissance exuberance of Spaniard Diego Ortiz, to the achingly beautiful Lament of Scottish composer Sally Beamish and the Baroque intricacy of one of JS Bach's Trio Sonatas, the music is brought to new and surprising life through the two musicians' astonishing virtuosity, seductive tone and - above all - through the intimacy of their duo. A number of Australian writers were sent an early edit of the album, and invited to reflect on the music with a letter to anyone - real or imagined - using the idea 'heard this and thought of you'. The response was overwhelming, the music inspiring contributions from cartoonist Michael Leunig, journalist Jana Wendt, poet Luke Davies, theatre director and author Scott Rankin, and novelists Helen Garner and Chloe Hooper. Their words are reprinted in the album's booklet. ‘Heard This and Thought of You’ is a landmark album by two of the finest and most imaginative musicians performing today.